Tiffaney Florentine, Trodo | Be Like Peter. 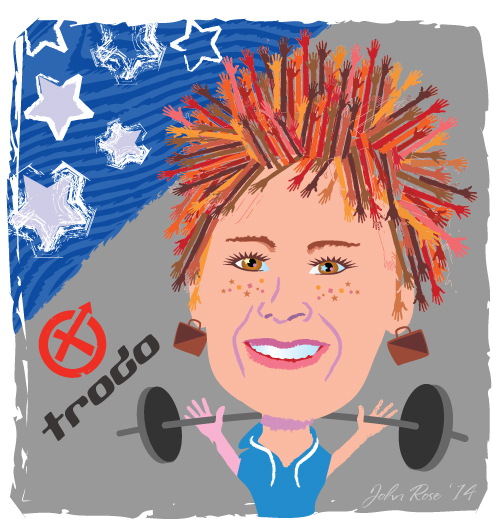 Company Description: Trodo is a health and wellness company that is creating functional fitness communities through corporate wellness programs, youth programs and league events. Tiffaney Florentine is a military vet, an American Gladiator contender, a CrossFitter and a certified personal trainer. She has an MBA from The Ohio State University, and has worked for the CIA, Deloitte, Ernst and Young and Gallup. She has mean chops on the athletic field and in the corporate meeting room; and she’s smashing it all together to create and scale functional fitness communities that are accessible, emotionally engaging and life-changing. 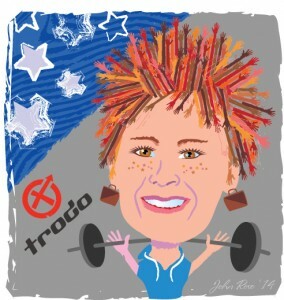 While working at Deloitte, Tiffaney tried out and was accepted to be on American Gladiator. “As the show aired, people started coming up to me (asking about fitness). I had 10 times the influence that I had before. TV is a scary thing! With all this in mind, Tiffaney went back to school, got a personal training certification and started working in healthcare consulting at Ernst and Young. She learned that corporate wellness programs were only focused on health risk assessments, biometric screenings and chronic disease management. versus emotionally engaging people to change physical inactivity. Kara Albert is Tiffaney’s co-founder. She is also her wife and she previously worked at Gallup with her before taking the plunge full-time into Trodo with Tiffaney. “Kara is incredibly talented. I feel that people often start businesses with their partners out of convenience, not because it’s the right talent. Kara is the perfect partner – hands down. She truly has the mind of a strong entrepreneur. She’s incredibly resourceful and can select, inspire and equip the best talent to bring the Trodo mission and strategy to life. Talent-wise we compliment each other really well. So what does “Trodo” mean anyways? “Trodo means vulnerability and it’s all about people putting themselves out there to be vulnerable, to get better as a community.” Trodo Box League currently has 26 participating boxes, 75 volunteers, a reach of ~4400 athletes, and is expanding to build structured, emotionally engaging programs in the workplace and youth environments. You can also follow Be Like Peter. updates on Instagram, Facebook and Twitter; or subscribe to our mailing list.